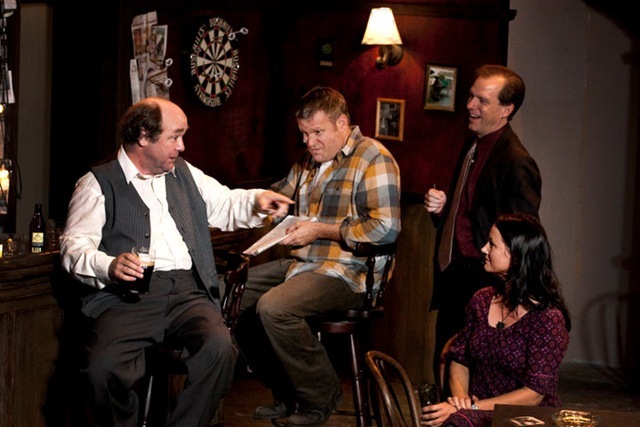 Considering the resumes of those involved, it’s surprising that Seanachai’s production of The Weir went unmentioned in many of those “fall previews” the theatre press is so fond of. 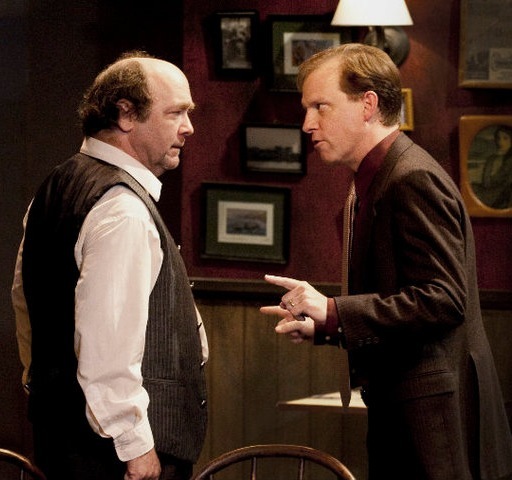 First off, the play was penned by a young Conor McPherson, the Irishman who also wrote The Seafarer and Shining City. Both of those had hugely successful Chicago premiers at Steppenwolf and the Goodman, respectively. To direct, Seanachai nabbed Matt Miller, the one behind the much-hyped Graceland (our review ★★★) at Profiles Theatre last year. And the small cast includes local stage stars like Sarah Wellington and Brad Armacost. Brad Smith, the youngest actor on-stage, even had a song featured on the “Up in the Air” soundtrack. There’s so many accomplishments listed in each bio, I’m a little surprised the program didn’t explode. What the lean, focused production made clear, however, is that Seanachai spent their time creating a terrific product instead of manufacturing buzz. The talky play is a perfect fit for Gaelic-centric Seanachai and their ensemble of vibrant storytellers. That’s what the piece is, essentially—a couple rounds of storytelling, all relating brushes with the supernatural. The attractive, urbanite Valerie (Wellington) finds herself in a rural pub usually occupied by several lonely men. The locals attempt to impress her with regional folklore and their meetings with the spirits that inhabit the country alongside them. However, as the beer bottles and dirty glasses pile up, Valerie reveals the most personal and unnerving close encounter of them all. The set-up might avail itself to some cheap, M. Night Shyamalan twist (“She’s really a ghost!”), but McPherson crafts a tale far richer, as well as much more disturbing. Miller and the cast don’t shock or frighten, but softly drill into the dark parts of the psyche. Like most of McPherson’s other tales, the show boils down to a few characters sitting around and talking. Does anything actually happen? It’s a valid question. There are only a handful of entrances and exits, and the whole thing takes place in real time with no intermission. Fistful of monologues after fistful of monologues wears you down after awhile. However, when one goes a level deeper, they find that McPherson is fiercely concerned with his characters’ internal struggles and the small, everyday friendships that keep us all sane. The script might make a slow pace appealing to a lesser director, but that would be suicide. The performers here know to keep moving at a fast clip while choosing moments to open up the play so the audience stays hungry. 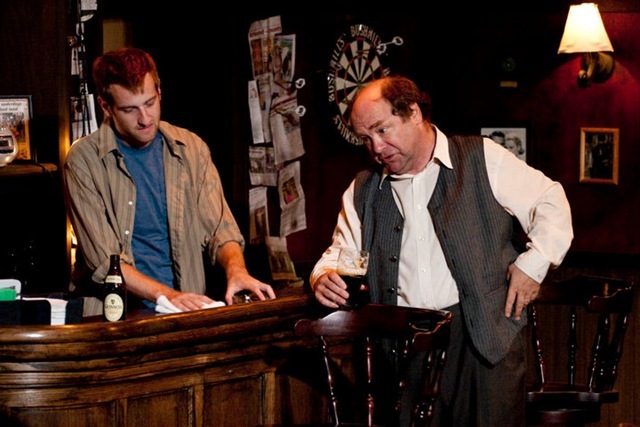 The play opens with Brendan (Smith), the owner of the bar, and Jack (Armacost), his best customer. 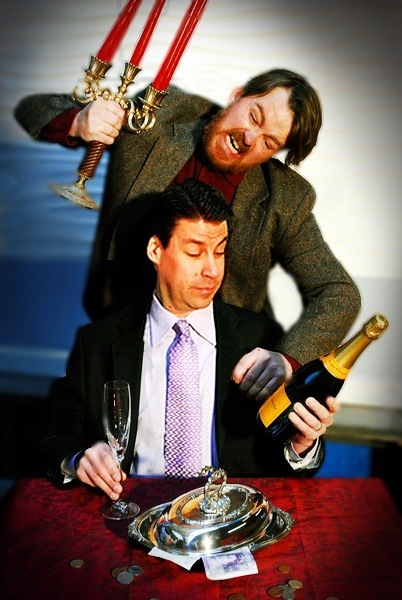 Armacost goads, blathers, and flirts with the hilarious disregard of an aging bachelor. He also manages to drag the audience along the hills and valleys of loneliness and redemption. Smith retains an aloofness that occasionally borders on being uninteresting, but he stays plugged in with the rest of the cast over the duration, playing along with the more eccentric patrons of his bar. Jeff Christian exudes all sorts of awkward charm as the tightlipped Jim, a man that can get closer to horseracing statistics than other people. Kevin Theis’s Finbar, the married man who takes it upon himself to show Valerie around town, rotates between sliminess and sincerity. Even though the character is obviously a tool, Theis musters up enough charm to make sure that the audience can never really hate him. The heart of the show, though, is Wellington’s Valerie. Through the course of the play, she moves from a passive object of affection to a revealer of heartwrenching yet relatable experiences. And Wellington truly shines, never shying away from visiting the most vulnerable parts of herself. Irish writers are known for their lyricism and long-windedness, and Seanachai eats it up. With The Weir, Miller spits out a dialogue-packed product that’s still able to tap into our deepest fears of the unknown. I’m guessing the buzz will quickly mount. Probably the most outstanding aspect of Brian Friel’s Dancing at Lughnasa is the deftly-written female roles. The story concentrates on the interactions, loves, and private catastrophes of the Mundy sisters, five adult women who live together in the fictional Irish hamlet of Ballybeg. Friel visits this made-up town in several of his plays, including his smash hit Translations, and here he shows a period directly before massive changes swept over Ireland and the world. Dancing at Lughnasa is Friel’s ode to nostalgia. It exudes the bittersweet feeling that come along with fond memories of a perfect instant in time, a moment followed by years of strife and hardship. 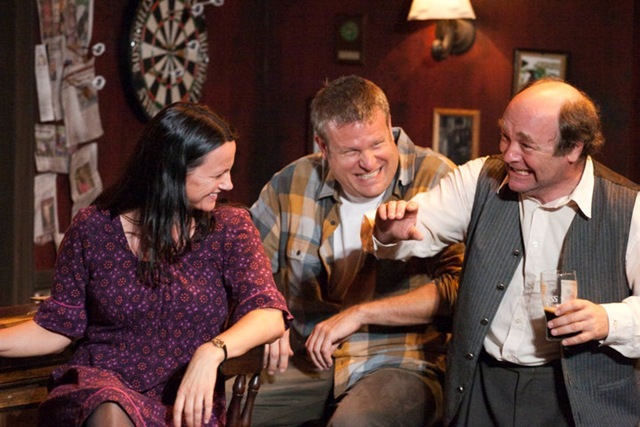 Friel’s play gets a delightful treatment by Seanachai Theatre Company, a group that focuses on producing classic and cutting-edge Irish drama (their home base is the Irish American Heritage Center). I’m about as Irish as a Shamrock Shake, but I was able to relate to this heart-wrenching production, directed by Elise Kauzlaric, on a visceral level. It explores themes that are familiar to us all: the sometimes devastating effects of change and the crystal-clear beauty of a perfect memory. 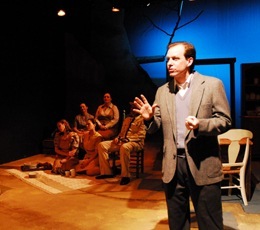 The 1990 play is set in the summer of 1936. Friel’s world is rife with tension; we’re watching the events directly preceding the bubble popping. In this Ballybeg, the Church is confronted with pagan practices (the play’s action takes place around the ancient harvest festival of Lughnasa), the industrial revolution is transforming rural life, and the problems of the world, problems which would explode in a few years, are creeping into the remote corners of Ireland. The narrator, Michael (the charming Kevin Theis), was seven at the time, but now tells us the story as a middle-aged man with the advantage of knowing what happens next. Not a whole lot of action actually occurs in the play, but we stay riveted to every scene because Michael tosses us tidbits of future adversity. Even though they are all adults, the Mundy sisters range a great deal in age. They are all unmarried and they all work very hard to keep themselves afloat. The oldest is Kate (a powerful Barbara Figgins), whose motherly leadership and strict Catholicism is equally resented and needed by her sisters. Her middle-aged peer is Maggie (Sarah Wellington), who fills the house with jokes, dancing, and soda bread. Rose (Anne Sunseri) and Agnes (Carolyn Klein) are both in their 30s and have a very special bond with each other. Michael’s mother Chris (Simone Roos) is the youngest, and allows herself to be strung along by Michael’s charismatic yet deadbeat father, Gerry (Philip Winston). The five sisters have to deal with a new addition to the household, Father Jack (Don Bender), their elderly uncle who just returned from a long mission trip to Uganda, where he has contracted malaria and left his Catholicism behind. The actresses have a great connection with each other, filling the house with lots of love and lots of hostility. Wellington shines the most—she is lovely, vibrant, and fun, yet can still find Maggie’s vulnerability and loneliness. The script says that Rose has a developmental disorder, but this doesn’t come across in Sunseri’s performance, she just seems like the youngest sister (which might be a choice by Kauzlaric). This isn’t a huge problem, but it muddles a later scene involving possible sexual abuse. Beyond this issue, the five women capture the sibling relationship wonderfully. Sometimes they are sweet as honey, sometimes they can’t stand to be under the same roof. Alan Donahue’s set handles the play well, but Sarah Hughey’s lights are clunky and disjointed. 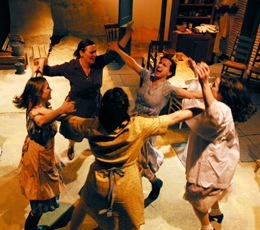 This Dancing at Lughnasa does not skimp on the dancing and music, all of it adding to the joy and drama of the piece. Even though every aspect of this show is Irish, it hits on something we all know. Seanachai’s production is gorgeous and tragic, dwelling on the wonderful calm before a terrifying storm.